Add Precise Joystick Control to TriCaster, vMix, Wirecast, or PC! No matter what type of PTZ camera you decide to use for your configuration, we have you covered. 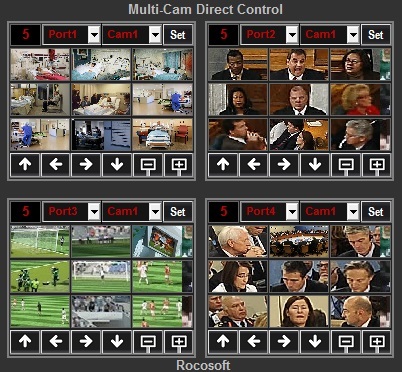 With options for VISCA, Canon, Pelco Serial Port protocols, CGI and VISCA over IP protocols, and UVC protocol camera control, our software solutions support virtually all professional broadcasting PTZ cameras available on the market today. 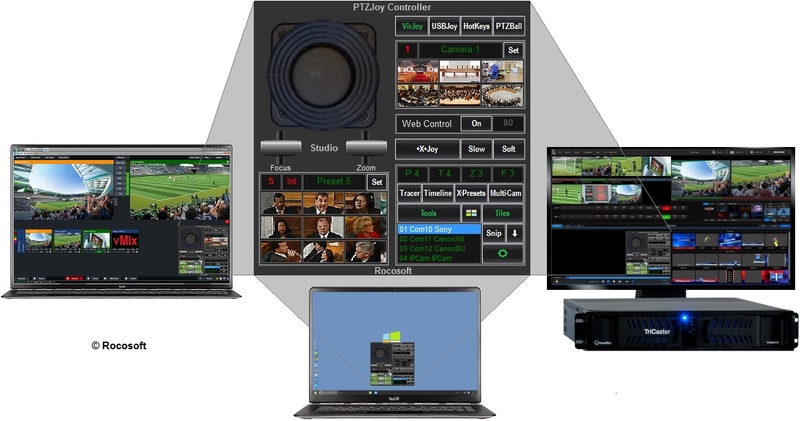 The PTZJoy software integrates into the TriCaster, vMix, Wirecast, or Livestream interfaces and adds advanced PTZ controls, powerful preset tools, and camera automation technology to your production system. Our software becomes part of your production system and provides you with professional PTZ control options and camera management tools and functionality that are significantly more extensive than those offered by the system's internal PTZ control settings. 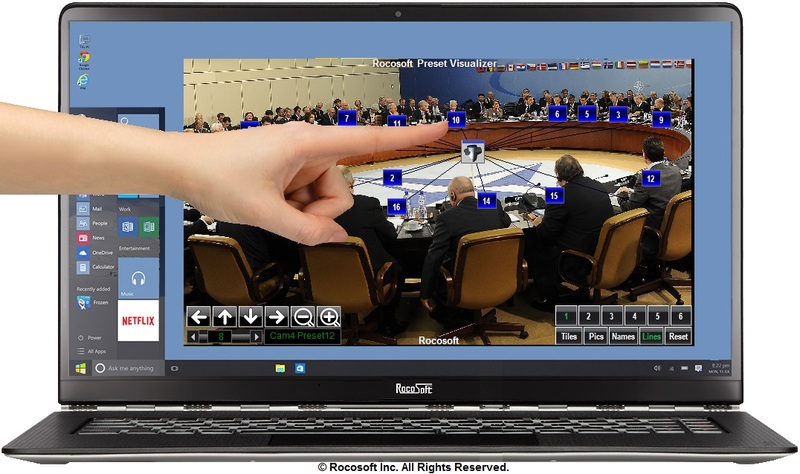 With several different control options, users can choose to control cameras with a virtual joystick, a USB joystick, keyboard shortcuts, button controls, or turn any laptop touchpad or trackball mouse into a joystick controller. Ditch the limited functionality joystick control surfaces! Turn any wired USB joystick, wireless Bluetooth joystick, or gaming joystick into a precise professional PTZ Camera Controller. Works with iPhones, iPads, Android phones and tablets, Windows phones and tablets, Google phones and tablets, Mac computers, PCs, and all other devices with a web browser. Supports all web browsers such as Internet Explorer, Google Chrome, Safari, Mozilla Firefox, etc. Our innovative PTZPad™ Panel creates a visual camera preset layout for one-click preset recall that is perfect for working with complex video production environments. This tool makes it so easy to SEE where your presets are instead of having to remember presets by number or name, and allows you to quickly jump to the preset you want with the click of a button. Forget about preset lists and never worry about clicking on the wrong camera or preset and missing a shot during your live broadcast. time. Great for creating daily schedules for cameras. 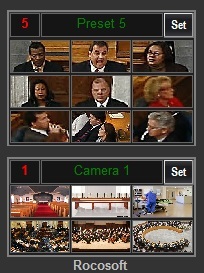 The Timeline Task Manager sends commands to multiple cameras simultaneously and is for executing playlists with complex multi-camera movements that can be saved, recalled, and looped. The Camera Tracer memorizes the trajectory of camera movements that can be saved, recalled, and looped. Manage Preset Tile Background Images. Control Pan-Tilt-Zoom of each camera with Directional Control Buttons directly from it's respective block. PTZJoy Studio is all about precise control and automation. You are able to automate your cameras using our most powerful automation tools. With AutoPan, you can set your cameras to automatically pan left and right on a given interval. All you need to do is activate it, and your camera will begin panning. You can change the interval (seconds) on which your camera moves. As with AutoPan, PresetScan automatically calls each of your camera's presets on a given interval. So, every x amount of seconds, PTZJoy will call your camera's next preset. You can also schedule timed tasks for your cameras to complete using our Task Scheduler. Multiple cameras can be given a task to complete at specified times, or they can all do the same task at the same time. With our TimeLine Task Scheduler, you can create a timeline of tasks for your cameras to complete. You can send commands to multiple cameras at once, loop the task list, along with choose just about any action for you cameras to complete. Get rid of annoying and repetitive joystick movements with our Camera Tracer. Camera Tracer allows you to record your joystick movements, save them, and then play them back. This is perfect for those that repeat Joystick movements, as you can play the recorded movements back for any camera. All you do is choose the starting preset, then click play. PTZJoy Studio includes the basic version of PTZPad, our powerful software extension that adds a visual component to your setup. The idea of PTZPad is to give you a visual representation of your cameras and their presets. In PTZPad, you can drag-and-drop presets onto a static or live background, and you can do this for multiple cameras. Each camera has its own preset button set, and each preset draws a line to the camera. For example, you can set the background image to an image of a church. Drag-and-drop your Camera 1 to the top of the church where the camera is actually located. Then, drag-and-drop each preset to its respective location. If Preset 1 is set to zoom in on the choir, drag-and-drop the Preset 1 box onto the choir location. Now, repeat this process for your Camera 2, which is located behind the audience. Once it's time for you to start managing your cameras, you can pull up PTZPad and simply click on the location you want your camera to go to. It's as simple as that! Now imagine doing those steps over a live background, say of a concert. You can dynamically move the preset buttons around as you need it.